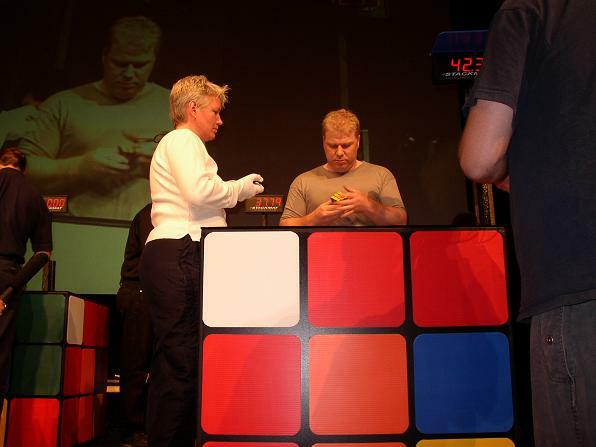 The second Rubik's Games World Championship was held in Toronto, Ontario Canada 23-34 August 200. This was jointly sponsored by KroegerInc, Hasboro, Seventowns and Hessport . Dan Knights USA, he won with an average time of 20.00 sec. Official fastest time was 16.53 set by Jess Bonde. The averages were really "bad", but the pressure prohibited the finalist from doing there normal thing. Before and after the final in the hotel lobby the top competitors managed to solve the cube in a bit more than 13 seconds with the same official timers! 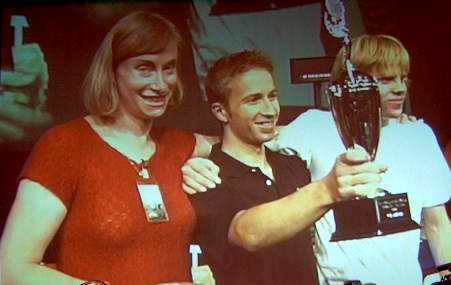 See what happens at the next world championship. There were about 100 -contestants from 17 countries, including the 7 year old Wiktoria Zborowski and the 73 year old Rune Wesstrom. Truly the Rubik's cube is a puzzle for all ages! We (Ron,Jaap Peter) and me arrived a few days before the start of the championship, we wanted to do some site seeing, we visited Niagara Falls and the Skylon tower. The next day there where many journalists taking pictures and interviews. The lobby was occupied with many speedcubers the hole week. To my surprise I ended in The Globe and Mail, a National News paper. We received at registration some nice contestant collectables a knapsack , a Chrome/Silver Promotion cube, T shirt and a pin. I was ready for my actions, I started of with the qualification of the 4x4x4, since my best time was 2:59, I had no change to get in the final, only the best three got to the final. So I was really relaxed, I ended 15th with an average of 2:59,55 my best time was 2:21,47. My practice really paid of, I smashed my personal record with more than 38 seconds. So I was really ready for the 3x3x3, unfortunate the qualification of the 3x3x3 was chaotic and I had to do the qualification the next day. This was really a bad thing, the next day I was really nervous, instead to perform in the little room the previous day, I had to qualify on stage with bad lights. I did really bad, I ended 39th with a best time of 33,93 seconds, I had trained for 30 seconds and hoped for a best time of 28 seconds. Although my best time was close to my average, I knew I could do better. I had hoped to end 30th, that was possible, maybe the fact that I could end in the top 32 and go the next round. On stage my mind did not what I had trained for, a strange feeling I guess the idea that I really had a good change to go the next round made the pressure enormous. I had a small success on my speedcube preparation and supplier of good cubes! 2th Jessica Fridrich used a Rubik's Studio Cube that see bought from me and I Prepared the cube for the finals for her! I am so proud! Many speedcubers used a cube that they got via me. I also repaired a few cubes, some one gave me a knick name "Cube Doctor". 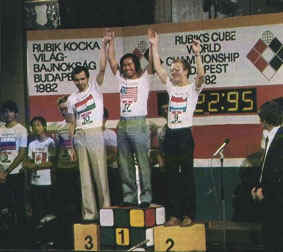 The first Rubik's Cube World Championship was held in Budapest on 5 June 1982. This was jointly sponsored by Politoys, Konsumex and Ideal. There were contestants from 19 countries. Minh Thai, the US champion, won with a time of 22.95 sec. Read all about it in Cube Circular Issue 3&4 Spring Summer 1982.